We tested out the new cooking gear for the post race meal at the Big Bend 50 Ultra Race next month in Big Bend National Park (website). 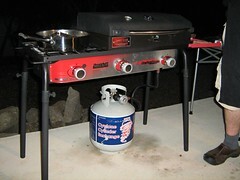 This beauty is a three-burner propane cooktop. The black thing is a metal cookbox which acts like an oven or grill.We cooked potatoes wrapped in aluminum foil in it in about an hour. 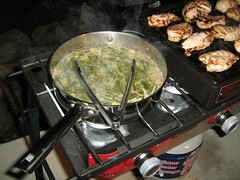 Then, we grilled boneless, skinless chicken breasts on the cast iron grill inside (they are in there now). stir in about two pounds of green beans and simmer until done. I brought it all to a good boil and then shut off the heat. The residual heat managed to cook the beans more than enough by the time the chicken was done. Look at the brown on those birds. The breasts were marinated for about a day in Italian dressing.The cast iron grill in the cooking box gave them a nice browning. 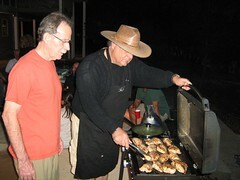 Then, the top down cooking kept the chicken nice and moist. We were pleasantly surprised at how evenly they cooked and how moist they were.